Did you know that twelve million lice infestations occur every year in the US alone? That’s 1 out of every 25 people! 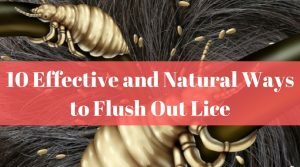 Recent studies show that over 99% of head lice in North America have become resistant to chemicals, so pesticides may not be your best option to get rid of lice. The following, natural remedies not only work extremely well, they may also have become your ONLY option. The following infographic introduces 10 of the best methods for getting rid of lice. Simply choose your method of choice and your kid’s lice will be gone in no time. Want to share this infographic on your site? Simply copy the embed code below! A fine-toothed nit comb allows you to remove lice and nits from wet hair, but this can cause some pain for children. Soak hair in oil, put a shower cap on overnight and you will smother lice (but not nits). You can try olive oil, coconut oil, mayonnaise, butter or petroleum jelly. Essential oils can act as natural pesticides. Your options include tea tree, lavender, rosemary, anise, ylang-ylang, sesame seed, or eucalyptus oil. As strange as it sounds – soaking your hair in Listerine and putting a shower cap on will make your lice move out. No mouthwash at hand? Try orange juice instead! Washing your hair with cheap booze is a great way to disorient lice. Afterwards, simply wash them out. Dissolve salt in apple cider vinegar and use this mixture to wash your hair. Vinegar helps loosen the lice’s grip on your hair, and salt dries them out. This is a radical solution with 100% guaranteed results. However, it will also radically alter your children’s looks. There are special devices available to dry out lice and nits with heat. Be careful with hairdryers – they may be too hot, and who wants crispy, fried lice? Lice can hide in your child’s personal items. Wash clothes, hair brushes, headphones and stuffed animals with hot water! Seal items that can’t be washed in plastic bags for two weeks. If you want to make sure lice have nowhere left to hide, you need to vacuum floors as well as upholstered furniture and wash bedsheets, pillowcases, and towels.